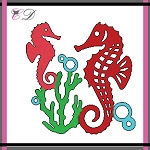 To create this card, I die cut the Sea horses images from white card stock with Cheapo dies. Then I colored them using Copic markers. For the background, I used painted fancy patterned paper from Recollections. I cut squares on a white card stock with paper trimmer and a light blue card stock with scallop stitched square Unbranded cutting dies. I mounted all elements on A2 size white card base using double-sided tape. Beautiful cards Gloria...I love love all the pretty colors and fabulous design! !